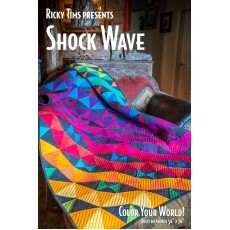 Shock Wave is a eye-catching and colorful quilt which is a large replica of a miniature quilt that Ricky Tims made over two decades ago. It features intense, colorful, hand-dyed fabrics with suede-like textures. The colors are intertwined to create a modern take on the timeless and traditional “Kaleidoscope” quilt block. Our hand-dyed kits are made on demand. Pre-orders for the kit to make this stunning quilt are underway. Quilt measures 50” x 70"
Seven yards of hand-dyed fabric to make quilt top and binding. Kit also includes pattern with instructions. Fabrics are approximately 45” wide.